Mr. Gates’ experience includes high pressure management roles, implementation of new use of operating systems, program and certified project manager with IT production as well as having been the Director of Business Development and Sales for a major corporation. Mr. Gates is recognized as a Subject Matter Expert in Homeland Security matters, Fusion Center development and training; as a contractor, he managed DOD analysis projects. Mr. Gates consults for two corporate Board of Directors as well as Chairman Emeritus of a 501(c)(3) Foundation. He is an adviser to a 501(c)3 that supports brain trauma and prosthetic research. 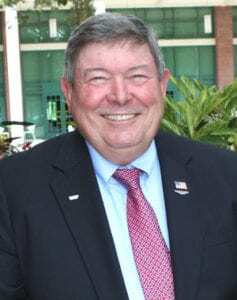 Mr. Gates is involved with the Military Veterans Program at the University of South Florida (USF) as well as a member of the USF Student Affairs Advisory Board. Mr. Gates served in the United States Air Force having had two combat tours in South East Asia. His eight years of military service was followed by a career in the FBI retiring in 1996. Mr. Gates is an avid golfer owning an additional company that conducts charity and corporate golf outings as well as golf tours to Scotland, Ireland and England.